Overview: Even in you aren't a famous celebrity, you just might feel like one for the day when you visit Wailea Beach. This glitzy stretch of golden sand sits right in front of two of Maui's most lavish, sparkling resorts (Grand Wailea and The Four Seasons), and it's Wailea's largest, most popular beach full of snorkelers, paddlers, and sunbathers. While the snorkeling here can be good, it requires a much further swim than you'll find at Ulua and Mokapu Beach, and the walk from the public parking lot is also a little bit further. 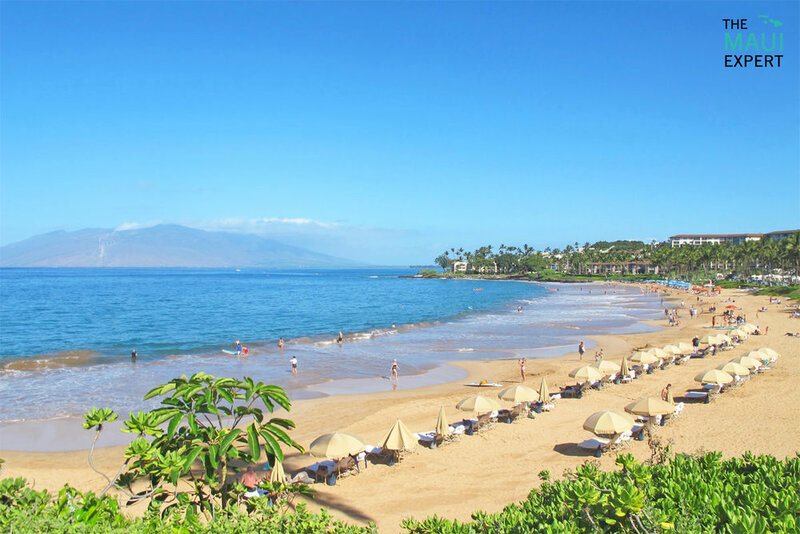 While mornings are gorgeous virtually every day of the year, Wailea Beach is exposed to the tradewinds—particularly in summer—so just like other Wailea beaches, the earlier you get here the better. Good For: Snorkeling, standup paddling, celebrity spotting, boogie boarding, sunbathing, swimming, and strolling the Wailea Beach Walk. Not So Good For: Afternoon tradewinds, the shorebreak can be rough, the crowds can be heavy, and the best snorkeling requires a far swim. Maui Expert Tip For Wailea Beach: This is a really popular beach with families, but if you plan to bring the little ones here, be aware that there isn't any shade and the waves are stronger than they look. Directions and Parking Situation: There's a public parking lot in between the Grand Wailea and Four Seasons Resorts. If you luck out you'll get a spot by the restrooms, but more than likely you'll have to go to the further, overflow parking.